Greetings programming friends! It’s Andy Gesner and the staff from HIP Video Promo, here with another provocative clip from an outspoken gang of Cali punk veterans. Periodically, we’ll read articles in the mainstream press complaining about how modern bands have abandoned the tradition of protest music. In the Sixties, we’re reminded, popular musicians kicked back at the powers that be; at this crucial moment, their modern counterparts have abandoned ideology for something safer. Well, that may or may not be true – but if it is, don’t blame the bands on Fat Wreck Chords. Over the past seven years, Fat Mike’s roster has delivered broadside after broadside at the government; while others have flagged, the Fat Wreck Chords bands have sharpened their critiques, focused their disappointment, and redoubled their efforts. Some may find irony in the fact that the bands in this loose affiliation of straightforward punk rockers have, by necessity, become trenchant social critics. We, on the other hand, know that groups like No Use For A Name have always been about questioning authority and speaking truth to power. If their songs seem more pointed these days than they did when the band started back in the late eighties, well, as another punk-poet once told us, the times are a-changin’. Which isn’t to say that No Use For A Name (or NUFAN, as they’re often called by underground-rock aficionados) would have been incapable of writing something as articulate and convincing as “Biggest Lie” for their 1994 debut. Even then, Tony Sly was channeling his outrage into stinging rebukes against suburban complacency and thoughtless conformity. But on 2005’s incendiary Keep Them Confused, his writing took a turn toward the overtly – and unashamedly – political. “Biggest Lie” (and Feel Good Record Of The Year, the stinging follow-up) picks up where Keep Them Confused left off. Over scalding six-strings and pounding drums, Sly barks out his disgust. “Left freedom bleeding on the roadside”, he roars, “we believe the biggest lie.” The whole thing feels like a challenge that’s impossible to dismiss; words hanging heavy in the air, demanding a response. And at a little under two and a half minutes, it’s over in a flash – it’s a quick punch to the gut, leaving audiences breathless. 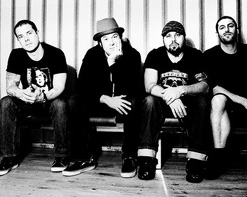 No Use For A Name has long been among the most reliably exciting live bands on the punk circuit. Their shows are cathartic, energizing, raucous, wild, celebratory: everything that makes this sort of music so indispensable. Director Justin Staggs has always been attracted to bands like that – he’s shot clips for Against Me!, The Soviettes, and many others – and his vision is a natural match for NUFAN’s enthusiasm and energy. Staggs specializes in recontextualizing performance footage: he likes to shoot bands in action in unusual locations or with strange backdrops, and he often juxtaposes concert images with other hallucinatory visuals. For the “Biggest Lie” clip, he strips away the stage altogether, leaving No Use For A Name to float among a blood-red sea of smoke, radio waves, and inverted patriotic signifiers. The punk band performs in front of an upside-down black and white American flag, a national seal bent on flying out of the frame, the Statue of Liberty, barbed wire, radio waves. It’s chaotic, dizzying, and oddly moving – the punk band steadying themselves and giving the audience their very best as the fabric of their nation unravels. It’s a great pleasure to be working once again with Brian Archer, Vanessa Brut, and the Fat Wreck Chords crew. You can get your hands on some copies of Feel Good Record Of The Year for on-air giveaways by dropping us a line! If you need more info, call Andy Gesner at 732-613-1779 or e-mail us at HIPVideo@aol.com. You can also visit www.FatWreck.com, orwww.MySpace.com/NoUseForAName to find out more about No Use For A Name.